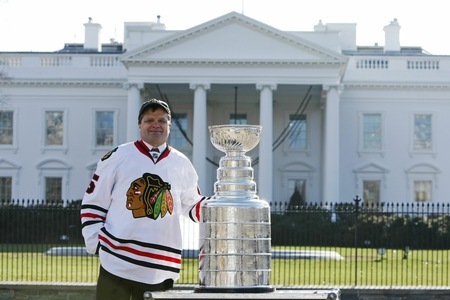 As part of our previews of the New Year’s Day Winter Classic, today we hear from a guy who knows more about Chicago, Washington, DC and hockey combined: Rep. Mike Quigley (D-Illinois D-Blackhawks). 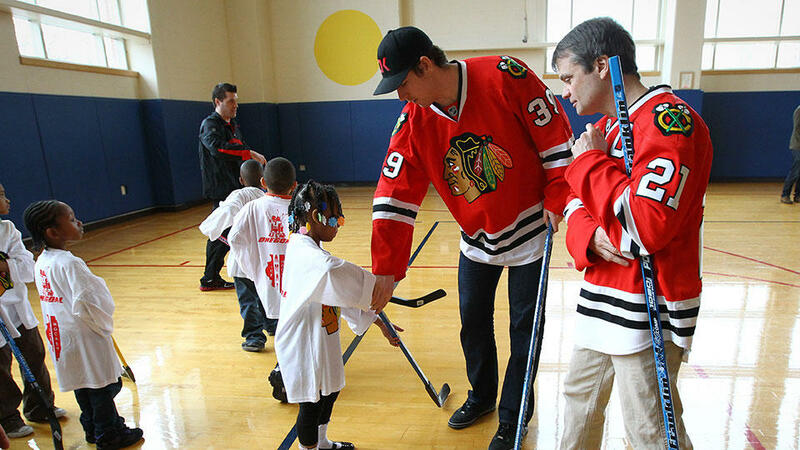 Chicago may be Quigley’s home, and Washington his work place, but hockey’s in his blood. 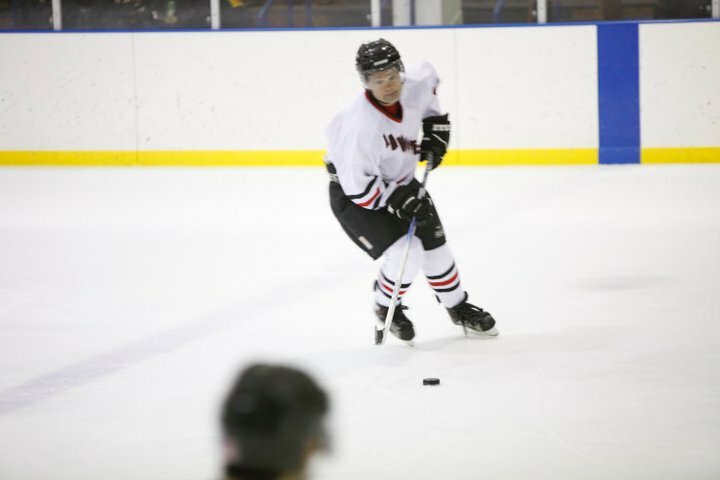 As chair of the Congressional Hockey Caucus – yes, that exists – Quigley can often be found either out on the ice – as when he plays against the USA Wounded Warriors – or working to bring hockey to the children of Chicago. He’s a Hawks fan through and through, but keeps a close eye on the Capitals, and shares his thoughts about this game, and The Game. What’s the Winter Classic mean for you? You’re actually talking to someone who’s played outdoor hockey. I moved to Chicago, a village called Carol Stream – back then just a subdivision with ambitions. There was a corn field and lagoons, and the lagoons would freeze over. One year when I was eight my parents bought me a pair of skates and a Northland wooden hockey stick. It was an incredibly cold winter, and I had no idea what I was doing. I put my skates on in the house with no blade guards, walked all the way to the lagoon on the skates and stepped onto the ice for the first time in an outdoor setting. I could hardly skate, but to the extent you could glide around the ice with a puck and a stick, I was hooked. It was freezing, incredibly bad conditions, the ice was rutted…but all of my early hockey was outdoors. I’m just now reminded there were certain rules. Like, if you shoot and miss, because it was two Folgers cans and a net, you had to go chase the puck which is sometimes a quarter-mile skate, and then you had to dig the puck out of a snowbank. Then after a while there were no lifters; which means that if you lifted it, it would be very hard for a goalie with no pads to stop it, and it kept giong on ice – there were no boards obviously so you had to go chase it and bring it back. We played because it was just amazing to play; 4, 5, 6 hours, all day. And we had a guy from the park district who did us a favor occasionally. He put his park district Jeep LED headlights onto the ice so we could play a little bit longer. Is that what makes the Winter Classic so special? I think for most of the people who will step out onto the ice January 1st, like Toews from Winnipeg, Pat Kane from Buffalo – their games were outdoors. That’s how they learned how to play. So for some to say ‘Oh well, you know, conditions are tough…”, that’s what they grew up with! I was on the ice at Soldier Field at a practice and I asked Toews ‘Just like Winnipeg, huh?’ And he made a very emphatic ‘no’ because it wasn’t nearly cold enough. It’s just so much fun – it’s such a special event. I can’t wait to wait to be there. We’re going to skate on the game on the 30th because I want to keep my string going with Black hawk games. I was on the ice at Wrigley in a game, I was on the ice at Soldier Field with the USA Warriors. I played with Brett Hull at the Park District Rink, YMCA, with the Elmhurst Huskies. So how are the Hawks doing? Amazing goal-tending and penalty killing, they have as much depth as any team in the league. They’ve got people who aren’t universally known that are playing at a all-star level. When I talk to my friends, I don’t they they appreciate just how good Hjalmarrson is. They hear of Keith and Seabrook, and Toews and Kane on offense; but this is a shot-blocking machine playing at an all-star level. How would you rate the Caps? I was surprised the Capitals still had a team. Just haven’t heard from them very much, eh? They have this problem with the “P” word: playoffs. They’re always a team where, they may get a little streaky, but do they have enough depth? Do they have leadership at that crunch-time? Do you win this game, do you win this series, do you move on; do you have people who step up at that time? I never doubted they’ve had enough talent to win the Cup. I’m not sure that’s the case this year, but the question still is: who fills that role? …so Kane is one of those guys. Toews, Seabrook. Who steps up for the Caps when it really matters? It’s not always when you do something big; it’s when the game is on the line. Do you score when it’s game seven? If President Obama attends the game, who should he root for? Make the case for Chicago. There’s no competition here. The hockey that he knew, before the Hawks turned it around, was last, a team that had almost given up, it was not a universally supported team. I’m part of a program to put floor hockey in every school in every district, and an ice hockey program across the city to expand diversity of the game. To remind the President: this is a team universally supported across Chicago with a very diversified base. I took a bike ride a year ago from the Lake to past Wrigley. I went through the Latino section, the Boys Town section, to South Port which is young professional area. Every street, everyone wearing Black hawk jerseys. He’s an eight year resident of DC, eventually he’ll come home to Chicago. So you don’t think he’s been treated well by Washington? Ummm…(laughs) Well, he lives in the White House, what can they do? No, he’s still a Chicago person. Care to announce any wagers with your colleague, Del. Norton? …half smokes maybe? Mumbo sauce? Nah, it’s like even their pizza. It’s like they take their pizza on the street and run a truck over it until the flavor gets beat out of it. You have to really look for good food. But I’d be willing to wage whatever Ms. Norton finds in they way of decent fare in exchange for Eli’s cheesecake. Ann Sathers’ cinnamon rolls. Pizza from just about anywhere. Hot dogs, bittersweet chocolate chip cookies, Dinkel’s donuts; Chicago is a culinary paradise. If Ms. Norton finds something worthy of competition, then I’d be glad to make the wager. We’ve repeatedly contacted the offices of Del. Eleanor Holmes Norton to get her view, and perhaps accept her colleagues’ challenge, but so far they have declined to respond. 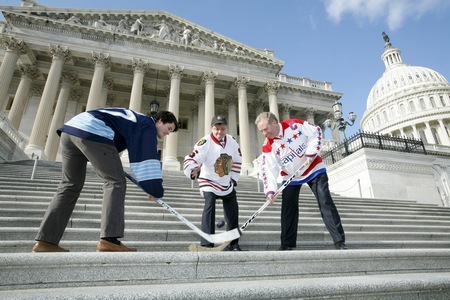 This entry was posted in Chicago Blackhawks, Washington Capitals, Winter Classic 2015 and tagged Chicago chirping, Congressional bets, Rep. Mike Quigely, Winter Classic 2015. Bookmark the permalink.